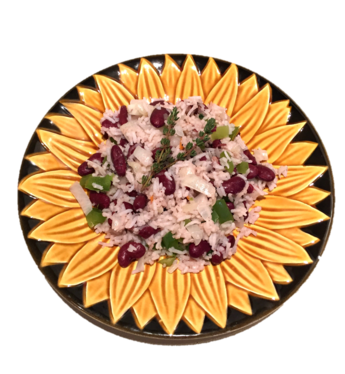 FamilyCook’s founder, Lynn Fredericks, adapted this recipe from a Jamaican cook in the New York City school system, with whom she worked when she began bringing food education into public schools. This dish is both flavorful and fast to make, so we include it in our curricula. Child Chop the onion slices into very small pieces. Adult Smash the garlic with the flat side of a chef’s knife to remove the peel. Slice the garlic. Child Chop the garlic slices into very small pieces. Adult Slice the bell pepper. Child Chop the bell pepper slices into very small pieces. Adult Slice the habañero thinly, wearing plastic gloves to keep the spicy oils from getting in your eyes if you touch your face. Adult Heat the olive oil in a large skillet over medium high heat. Add the onion, garlic, bell pepper, and habañero. Reduce the heat to low and cook vegetables, stirring often, about 10 minutes, or until softened. Adult While the veggies are cooking, open the can of beans and coconut milk. Adult & Child Rinse the beans in a colander. Measure the coconut milk. Wearing oven mitts to protect hands, add both to the cooked veggies. Adult Add the cooked rice, salt, and pepper. Add the entire sprig of fresh thyme. Mix thoroughly and cook on low heat, covered tightly, for 10 to 15 minutes. Serve with seasonal salad.